The style of this Men's Round Diamond Cross Ring in 10K White Gold is strong, making it a fitting reminder of Christ's ultimate act of love. A small diamond accents the three-dimensional cross that's displayed by this cool, modern piece, while the 10K white gold from which this piece is crafted provides classy shine. At 10mm wide at its widest point, this is a ring that isn't afraid to make a statement of faith, and it does so with class. 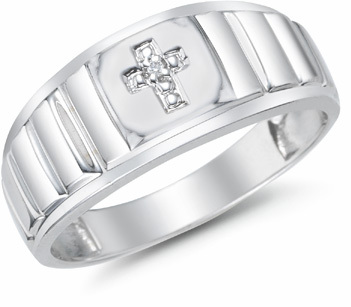 Men's Diamond Cross Ring Set in 14K White Gold. Ring measures 9mm at the top and graduates down to 6mm at sides of ring. We guarantee our Men's Diamond Cross Ring, 14K White Gold to be high quality, authentic jewelry, as described above.